When the moon hits your eye like a big-a pizza Pi, that’s 3.14159 26535 89793 23846 26433 83279 50288. Or, it’s cheesy deliciousness and you should probably wipe it off your face and eat it. All I knew about Pi going in was that it is apparently so good, President Obama himself invited the owner to cook the pizza at the White House. Didn’t know that? Google it. I am a true St. Louisan in the fact that I LOVE provel cheese, and I love paper-thin crust. 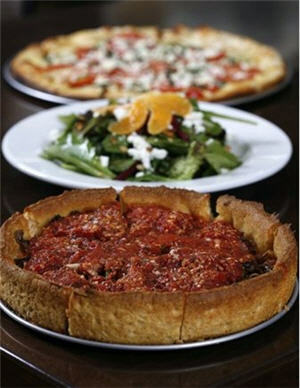 Although Pi offers deep-dish pizza, they also stay true to their St. Louis locals with thin crust. Provel, though…that’s a big NO. Pi’s main cheese ingredient is mozzarella. Like I said, I’m a thin crust kinda girl, but there was a deep-dish pizza, The Delmar, that sounded amazing. So Emilie, our server, made my life much more fulfilling by having the cooks create The Delmar on thin crust! How great is that? Any pizza listed can come thick or thin! Again, if you are from St. Louis you’ve probably eaten a variety of St. Louis style pizzas, or even chain restaurant pizzas…but I’ve never had a slice of pie quite as good as Pi’s! The Delmar was a BBQ chicken pizza made with Mille Amish Chicken, mozzarella and cheddar cheeses, onions, green and red peppers and cilantro. There were so many toppings I thought the thin, little crust would be soggy. No sog! It was as crispy as it would have been with just one topping. I can normally eat 2-3 triangle slices of thin crust pizza…I was stuffed after one slice of Pi. Not only does Pi have amazing pizza, but they’re unique in their own way. Pi serves gluten free crusts AND beer, has vegan-friendly menu options and is a Green restaurant. Their pizza is truly good for the Earth! They also have a great Happy Hours (Green Hours) everyday from 11 – 6. Pi Pizzeria is quickly becoming a St. Louis favorite, now with three locations -The Loop, Kirkwood and Central West End. Visit www.restaurantpi.com today to see other great menu options and to get directions to your neighborhood Pi.